There’s no denying that fries are universally accepted comfort food. They are delicious and the fact that you’re almost expected to eat them with your fingers is very appealing to me. What can I say, I love finger food and dips so this is the perfect snack for me. These are incredibly easily made, can be changed to suit your taste and far less fatty than their deep-fried counterpart. 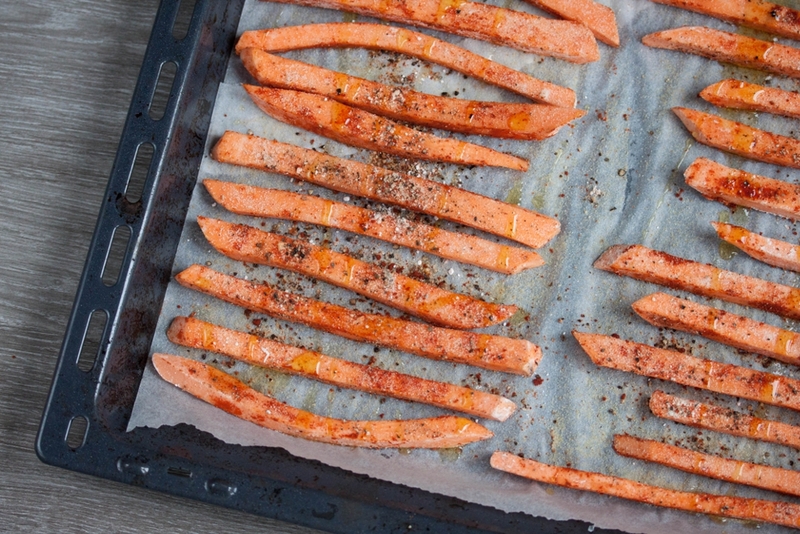 If you never tried to bake your fries in the oven then you should definitely give these crispy sweet potato fries a chance. There was a time when I thought I had to abandon my favourite snacking combination of fries and mayonnaise. That was simply due to the fact that mayonnaise contains eggs. Yes, I am one of those people. I eat my fries with mayonnaise. They can be great with ketchup but that is not my first choice. 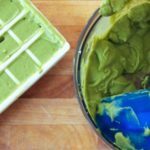 Luckily I managed to find several ways to make mayonnaise egg free but the avocado version is by far the tastiest. 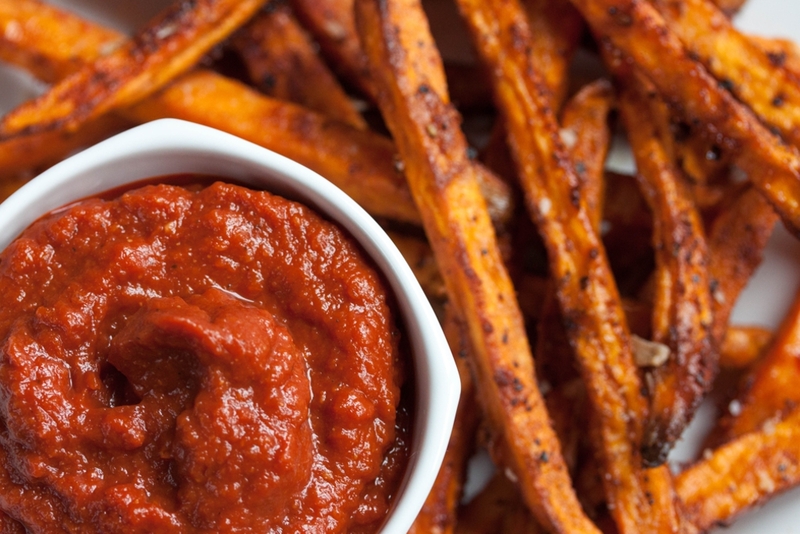 If you for some reason prefer your sweet potato fries with ketchup then you can try out this Hot & Spicy Home Made Ketchup. It has a slight kick to it due to the chillies but let’s get back to sweet potato fries! 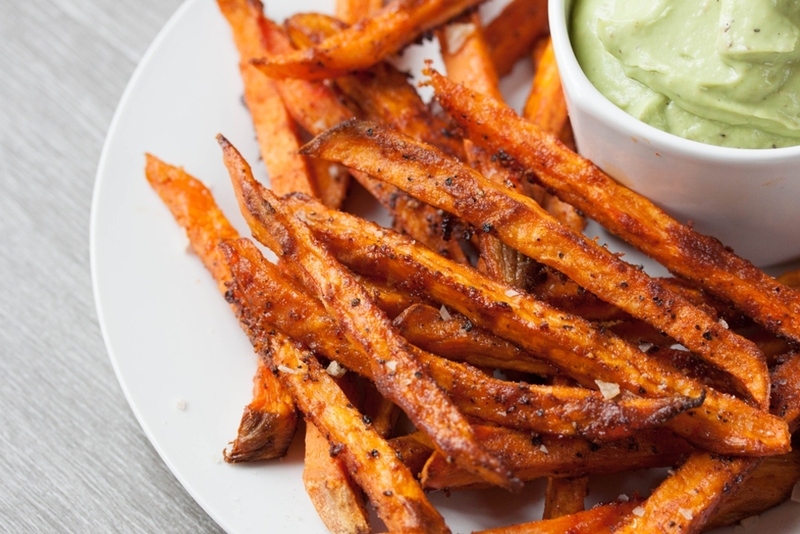 Getting the perfect crispy sweet potato fries can be tricky but it is not impossible. It took me a while to find a fool proof way that works each single time and it starts with soaking the raw potato fries in ice cold water. 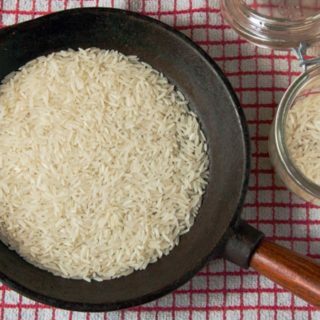 Doing this will draw the excess starch out, which will help them to crisp up. I let them soak in the cold water for about 45 – 60 minutes. It highly depends on how patient I am but from experience, it pays off to wait a whole hour. Once they are done soaking discard the water, give them a very quick rinse with cold water and pat them dry with a kitchen towel. Place them in a bowl and add 2 tsp of corn starch. Gently mix them until they are evenly covered. Place them on a baking tray that is lined with baking paper and make sure they touch each other as little as possible. Scatter the seasoning over them and drizzle with the olive oil. Do NOT add any salt at this stage. If you do that it will turn the fries soggy. Add the salt after they are baked, just before you eat them. Bake them in a preheated, fan assisted oven for about 30-45 minutes at 200°C (390°F). The duration depends on how thickly you cut your fries. 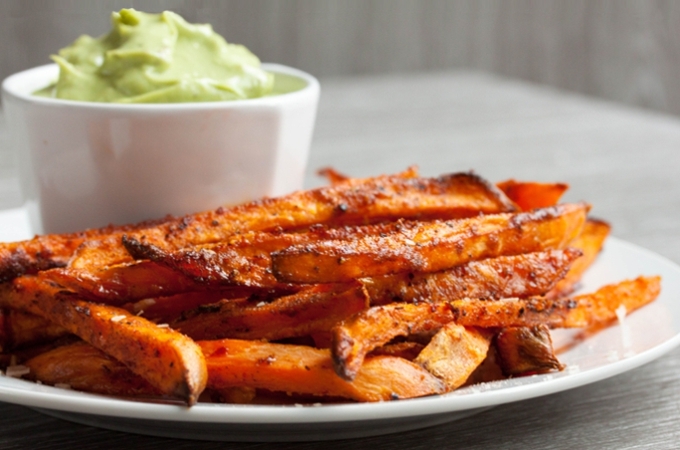 There are two little tricks that will help you get the perfect sweet potato fries. Once the sweet potatoes started cooking and the oil is bubbling, open the oven door just a tiny bit. Enough to let all the steam out that gathered in the oven at this point and close it quickly again. It should suffice to just open it for a few seconds, do not overdo it or the temperature will drop too much. The second trick is to turn the oven off once your fries are done and let them sit in the oven for another 5-10 minutes. 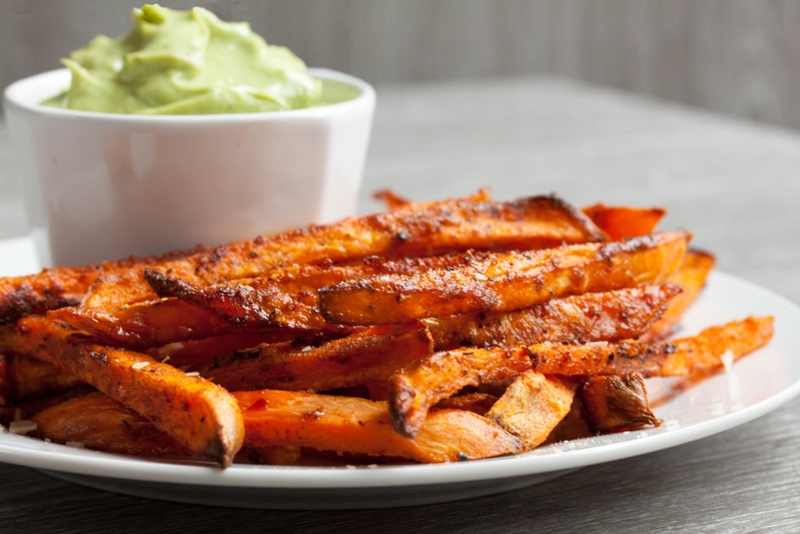 These crispy sweet potato fries are far less fatty and healthier than their deep-fried “white” cousin. You can choose whatever seasoning you like for these; I just happen to love my food hot and spicy but you might as well season them with just pepper and salt or add rosemary and garlic. Just keep in mind to never add salt until after they are cooked, this is especially important if you use ready-made seasoning mixes. If they contain salt then bake the fries with just the oil and add the seasoning mix afterwards. In any case, you will end up with a delicious heap of perfect crispy sweet potato fries if you follow these steps. If you've never tried to bake your fries in the oven then you should definitely give these perfect crispy sweet potato fries a chance. 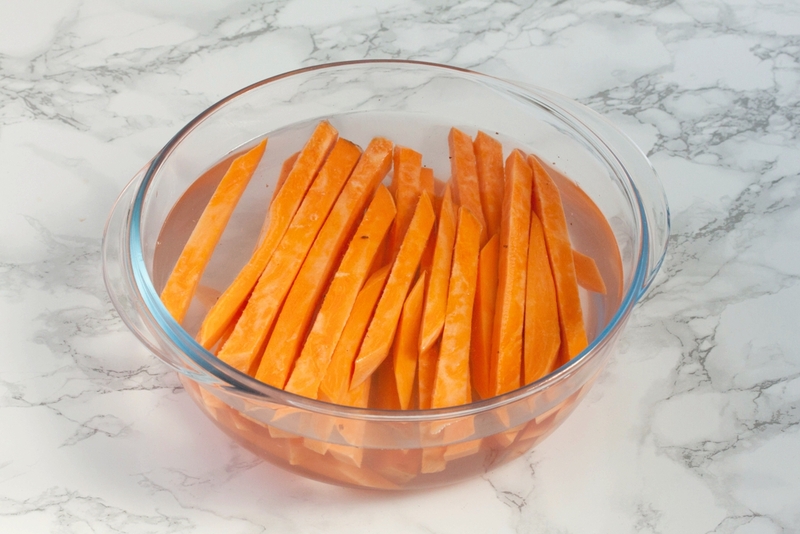 Peel and cut the sweet potato into strips. I tend to cut them into 1cm (1/3 inch) thick pieces. Place them in a cold bowl of water and let them sit for 45-60minutes. Discard the water, give them a very quick rinse with cold water and pat them dry with a kitchen towel. Place them in a bowl and add 2 tsp of cornstarch. Gently mix them until they are evenly covered. Place them on a baking tray that is lined with baking paper and make sure they touch each other as little as possible. Drizzle your fries with olive oil and season them with the spices. Do NOT add any salt at this stage. If you do that it will turn the fries soggy. Add the salt after they are baked, just before you eat them. 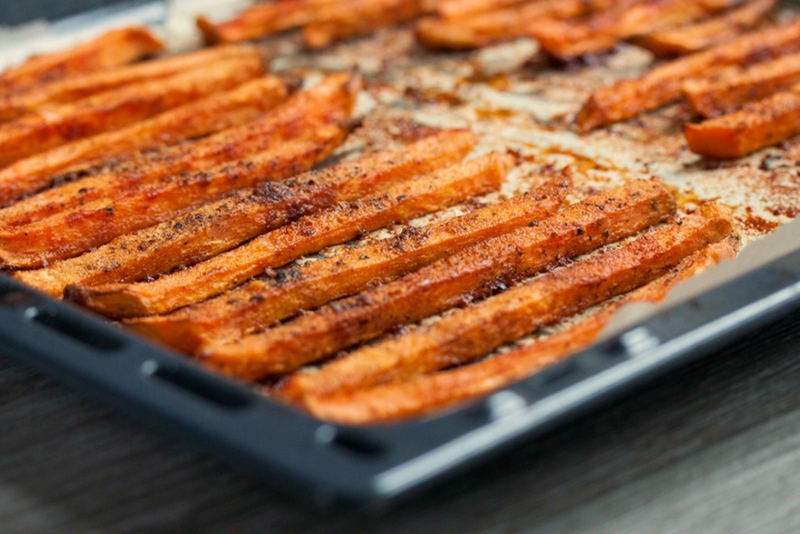 Bake your fries in a preheated, fan assisted oven for a total of about 30-45 minutes at 200°C (390°F). The duration depends on how thickly you cut your fries. Once the sweet potatoes started cooking and the oil is bubbling, open the oven door just a tiny bit. Just enough to let all the steam out that gathered in the oven at this point and close it quickly again. It should suffice to just open it for a few seconds, do not overdo it or the temperature will drop too much. Turn the oven off once your fries are done and let them sit in the oven for another 5-10 minutes. 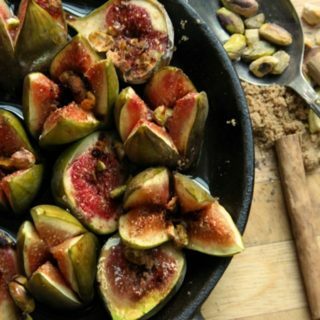 Just before serving season them with salt and serve them with whatever you prefer. I’m definitely giving this a go later this week. I am looking forward to crispy instead of my standard somewhat soggy-style fries. Thanks for the crispy tips! Hello, reporting back. Everything went well and these were a big hit. First time ever I have had sweet potato fries turn out crispy making them at home. Thanks again! Glad to hear! – Love, G.
Sorry for the confusion it is corn starch – a snow white powder. Not to be confused with corn meal which is gritty. – Love, G.
Worst recipe ever. Soaking them in water just made them soggy even after cooking them for two hours. I’m sorry this didn’t work out for you. Soaking potatoes (sweet or regular) is a method that has been around since decades. It draws the excess starch out to give you a crispier result. 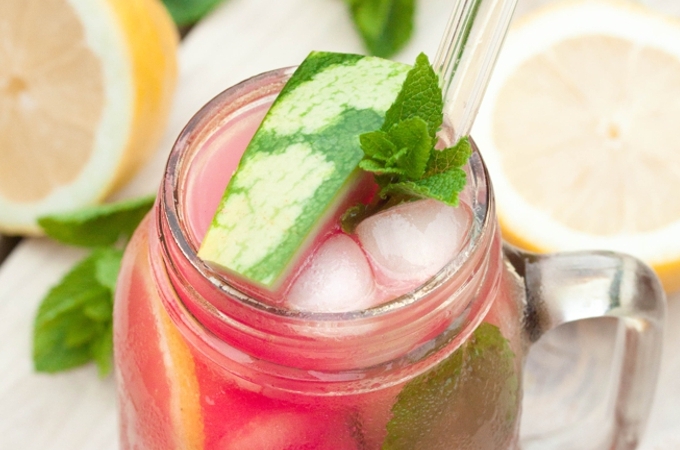 Try adding a bit of vinegar to the water. Make sure to rinse the water clean before sitting. Did you dry them off real well? That was my problem the first time. Oh this is so helpful!! I think mine were a little damp 😦 so they turned out soggy. Def going to try again! These were soooo good !!! I didn’t read the recipe re the temp – so ….I put them in at 200 for 45 minutes & ya they csme out mushy …but then irealized Ceintgrade vs Ferinheit & put them on the right temp for another 30 minutes ! They came out perfect !!! I used cinnamon vs. Smoky paprika …NICE ….try it …you’ll like it ! And the sauce I jsed my mom”s. 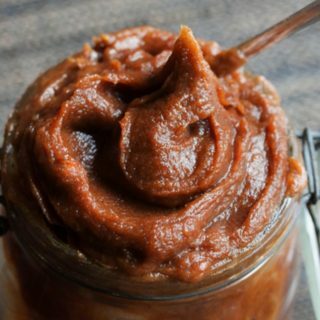 Fish stick sauce when we were kids – katchup & mayo – mmmm so! Good ! Hello Sam, cinnamon is a wonderful idea! I will try it this weekend and let you know. Thank you so much for the tip! – Love, G.
Loved these. 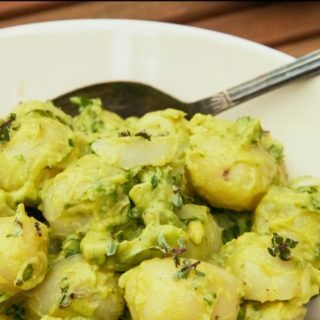 Would this work with regular potatoes as well? I liked the consistency but they are too sweet for my liking. Can that be changed with seasoning or are sweet potatoes just always going to be sweet? 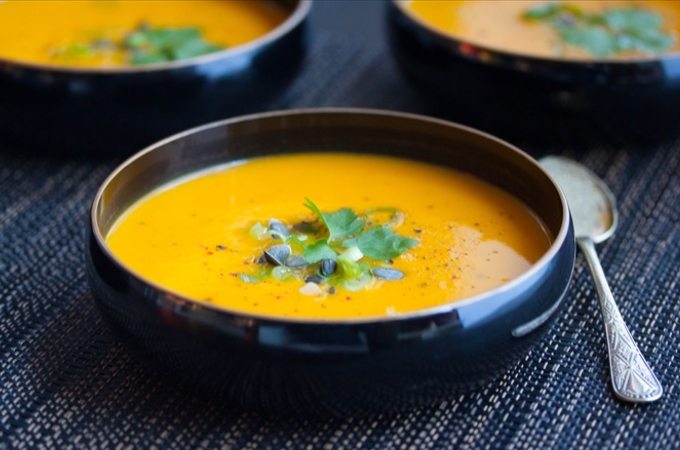 Sweet potatoes are what they are, not much you can do about that. Savory seasonings might tone down the sweet taste a bit though. I can only agree with that. Also a savoury dip might help but there is little you can do about the sweetness. – Love, G.
I always sprinkle mine with Parmesan cheese and that helps cut the sweet! Also fresh cracked black pepper! I left the oven door cracked while letting them sit for the additional resting time. Great fries! Not as crispy as french fries but good enough. Would soaking them longer give crisper fries? I loved these, no idea what the others are complaining about.. first crispy sweet potato fries ive made at home..
Do you flip the fries half way through cooking? I flip them when the tray is really crowded but generally I don’t do that. – Love, G.
Is it corn flour or corn starch recipe states corn flour and above directions says corn starch. I never cook with either, does it matter? Is there a little tip/trick to prevent this? I lined it with baking paper and did everything according to the recipe so perhaps there is a little something I should try next time to prevent this? Mine never stick to the baking paper. I wouldn’t know where it went wrong. Was the tray too crowded? Were they properly dried before placing them on the tray? Did you accidentally salt them before baking? I know you wrote you followed the recipe but those are the only things that I know could make them stick. Or…did you use baking paper that can only be used on one side? I had that happen to me once with a cake now that I think of it. Bought a baking paper that was slightly shiny on one side and rough on the other. Used the wrong side. Ruined the cake by doing so. – Love, G.
You should have seen my cake! ? I literally peeled the crust off by removing the baking paper. Poor thing looked like someone gnawed on it. Was impossible to apply frosting or salvage it in a dignified fashion so I crumbled it up and had it as breakfast “cereal” the next few days. #NoShame – Love, G.
I would love to try this but will be short on time the day of my party. 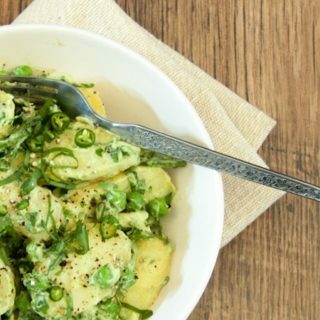 Have you tried soaking the potatoes the day before? Do you think that will work? I have not tried soaking them a day before so not sure if that will work. Longest I soaked them for was 2 hours. I’m sorry I can’t answer that one. – Love, G.
These fries were really tasty and super crispy. I added roasted garlic. Super good. I will make these again for sure. I was sceptical about these as I do not like sweet potatoes unless they are crispy and I read the reviews which were either one extreme or the other. So, after soaking them for an hour, I let them sit on a cooling rack for about 2 hours to dry completely. I layered them single layer and they turned out perfectly crispy after the recommended cooking time. The only mistake I made was thinking I could use stoneware. I transferred that batch to the regular baking sheet after realizing the other batch cooked much better and quicker. I LOVED these and will definitely make again. I am glad these worked out for you.they really seem to be a hit or miss with people. Even within my family. 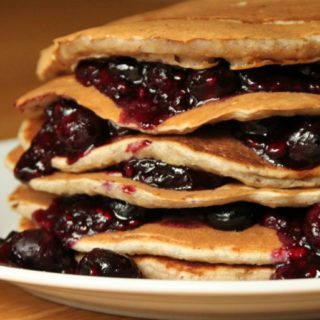 Some say they turn out perfectly and others say it’s a soggy mess. I am still trying to figure out what causes this recipe to fail so badly for some. – Love, G.
You mention a convection (fan-assisted) oven. Could it be that those with regular ovens are having the issues? Convection definitely runs hotter and drier than a regular oven. I haven’t tried the recipe yet, but that was the first thing I thought of while reading through (since my current ovens are not convection). Any tips for cutting, sweet potatoes are so hard! Made these tonight. They’re not bad at all. Not super crispy but somewhat crispy. I found your recipe on Pinterest today and decided to give them a go. I usually make my sweet potato fries in my actifry and they turn out ok. Ok isn’t good enough my books. Aside from me cooking them to long (I forgot to set the timer and was multi, multi tasking) they turned out perfect. Best sweet potato fries I’ve had and that includes from a restaurant. I paired these badboys with my white truffle aioli and a made from scratch margarita and I was in heaven. Thanks for the recipe!! Cheers! Hello Shannon. Glad they turned out this great for you. White truffle aioli sounds amazing I need to give that one a go sometime. – Love, G.
These look great! I can’t eat corn. 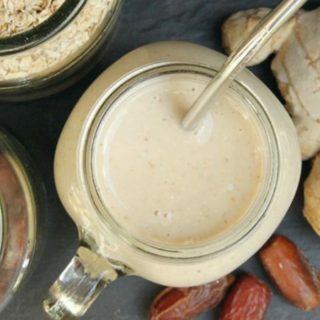 Do you know if arrowroot powder or something else would work? What does the cornstarch do, and maybe I can figure out a replacement. Hello Kelly, it absorbs the little bit of moisture that is left and helps the crispness. You could try potato starch or very, very fine flour of your choice. A reader of mine had success with coconut flour but personally I have not tried that version yet. Have a great week. – Love, G.
Could I prepare the potatoes the night before keep them in the fridge and cook them the next day? Hello Britt, I am not sure that would be a good idea. I once “forgot” my potatoes in the fridge and they turned slightly brown. I did not cook them because they looked so odd but you could try if you want to and if you do then let me know how that turned out. – Love, G.
Experienced cook for over 45 years. Never had crispy sweet potato fries. Tried this recipe. I live in the USA so went with the 390F on a convection oven. Followed the recipe exactly. Fries were burnt in 20 minutes.. I am sorry this didn’t work out for you. – Love, G.
Convection ovens always cook faster. I’m sorry they turned out soggy for you. I have no idea what could have gone wrong. Did you maybe salt them before you put them in the oven? That will make them soggy. Or maybe you cut them a little too thick? 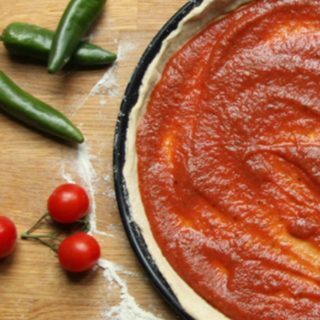 Did a lot of steam/humidity gather in your oven? Trying to think of what else it could be but it’s hard from a distance. – Love, G.
I am not so sure what classifies as paleo. You need a slight coating to get the crispiness. Is rice allowed? Maybe some rice flour? I tried to find an answer on google, but the opinions on rice are very split. 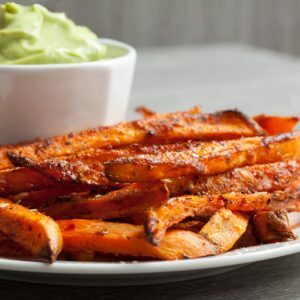 – Love, G.
I’m going to try these today and will let you know how they turn out, since I’ve also tried making crispy sweet potato fries before but with no luck. Thanks for all the tips. 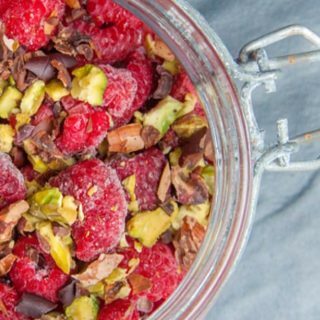 Absolutely loved this recipe! Thank you! I’ve always struggled to make homemade fries in the past, but your tips and tricks really helped. AND it will save me a lot of money. Woohoo! Thanks, again. Sharing with friends and family.